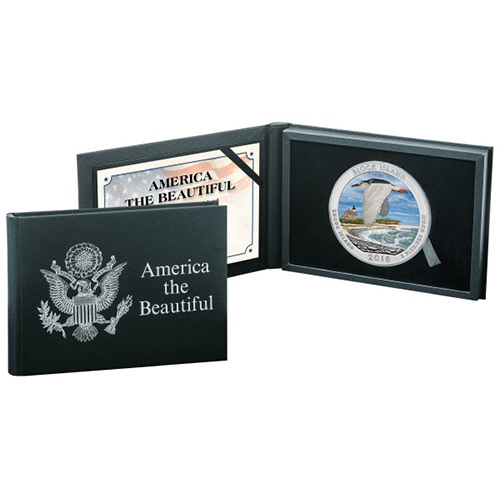 The America the Beautiful Series of silver coins from the United States Mint offers 56 different designs in a series set to stretch from 2010 to at least 2021. The coins in this collection are primarily offered by the US Mint as bullion or burnished coins. Third-party dealers occasionally bring something unique to the collection in the form of colorized coins. Today, 2018 5 oz Colorized ATB Block Island National Wildlife Refuge Silver Coins are available to you online from JM Bullion. Available to you with protective packaging! 5th coin of 2018 and the 45th overall in the ATB Series! Limited availability of colorized coins! The face value of $.25 is fully backed by the US government. On the obverse is President George Washington. The reverse depicts a heron in flight over Cow Cove beach on Block Island. Represents Rhode Island in the ATB Series. Commemorates Block Island National Wildlife Refuge. The United States Mint does not offer colorized coins as part of its category of gold and silver for sale. The colorized US coins you find on the market, such as these 2018 colorized ATB coins, are completed after production by a third party. Bullion versions of the release are used to add colorized lacquer to the designs for a unique twist on the vision of the US Mints designs. 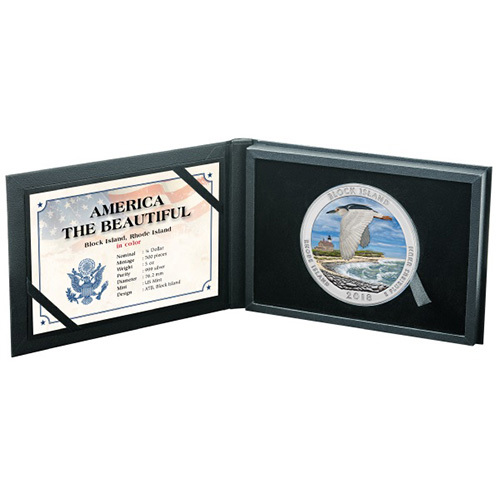 Al 2018 5 oz Colorized ATB Block Island National Wildlife Refuge coins are, as a result, available to you in Brilliant Uncirculated condition. The coins are individually housed inside of protective packaging. The America the Beautiful Series launched in 2010 and is scheduled to run through 2021, though the legislation authorizing the program leaves the door open for the Secretary of the Treasury to grant an extension to the program through 2033. 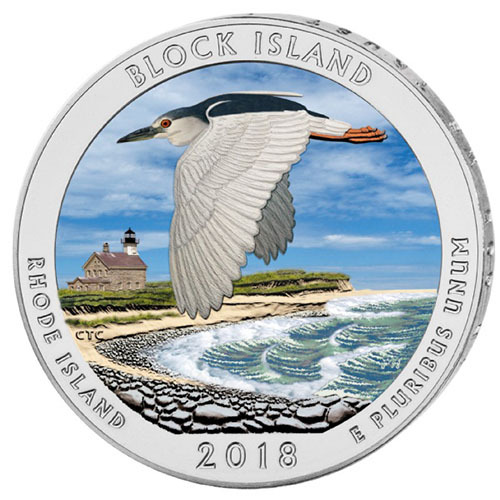 On the reverse of 2018 Colorized ATB Block Island National Wildlife Refuge Silver Coins is the image of a black-crowned heron flying over the beautiful scenes at Cow Cove beach on Block Island. The scenery comes to life with vivid colors for the beach and waters of the Atlantic Ocean, while the lighthouse in the background and night heron in flight have their own distinct colorization. The obverse of 2018 5 oz ATB Block Island National Wildlife Refuge Silver Coins features no colorization, just the left-profile portrait of President George Washington. This design is a modernization of John Flanagans 1932 design for the circulation US quarter that remains in use today. Please feel free to reach out to JM Bullion with your questions. You can call us on the phone at 800-276-6508, chat with us live online, or simply send us an email.